When building an Internet of Things (IoT) system, choosing a platform to design and build a system is very important. ARM Inc is a well-known ARM microcontroller manufacturer, which is widely used in embedded systems and mobile devices. With the advantage of the chip designer, this company provides a complete platform for developing IoT systems, called ARM mbed IoT Device Platform. 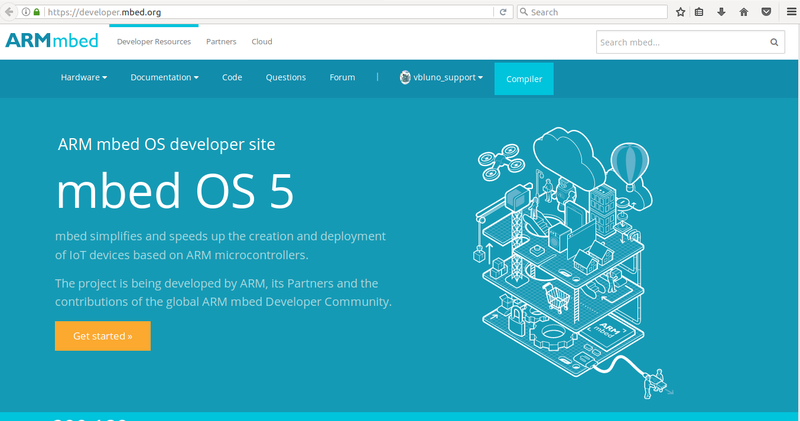 Important component of ARM mbed IoT Device Platform is the embedded operating system for ARM Cortex-M microcontrollers, called mbed-OS. It is evaluated as an embedded operating system that is well suited for developing IoT systems with basic features such as: security, multiple interfaces, RTOS, multiple libraries for common types of sensors and peripherals and in particular it is open-source. Let’s take a look at some of the basic features of the mbed OS. 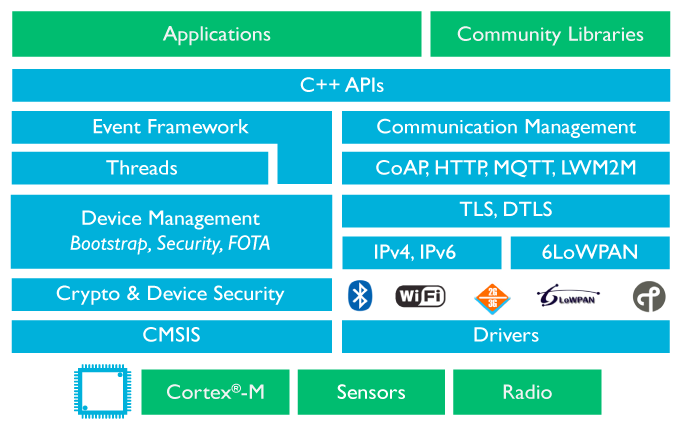 Device and component support - With support for mbed OS on a wide range of ARM Cortex-M based devices, developers can prototype IoT applications quickly on low-cost development boards. - Simple USB drag and drop programming allows you to rapidly prototype without the need for expensive debug hardware. Realtime Software Execution With an RTOS core based on the widely used open-source CMSIS-RTOS RTX, mbed OS supports deterministic, multithreaded real time sofware execution. The RTOS primatives are always available, allowing drivers and applications to rely on features such as threads, semaphores and mutexes. Open source Released under an Apache 2.0 licence, you can use mbed OS in commercial and personal projects with confidence. Ease of Use - With a modular libary structure, the necessary underlying support for your application will be automatically included on your device. - By using the mbed OS API, your application code can remain clean, portable and simple, whilst taking advantage of security and communications. - We provide a huge range of code examples that you can import into your own projects, demonstrating how to use each of the APIs. Community - The mbed community allows contribution and collaboration between ARM, over 50 partners, and hundreds of thousands of individual developers all over the world. - Many of our components and projects have been contributed by the community. Our forum and Q&A provide developers with community support, alongside GitHub for technical input. - Hardware Enforced Security At the lowest level of mbed OS, we use a supervisory kernel called uVisor to create isolated security domains which restrict access to memory and peripherals. -Communications Security We take SSL and TLS, the standard protocols for securing communications on the internet, and allow you to include them in your mbed project with a simple API. Drivers and support libraries - Driver support for a wide range of standard MCU peripherals is included in mbed OS. This includes digital and analog IO, interrupts, port and bus IO, PWM, I2C, SPI and serial. - The C libraries of each supported toolchain are also integrated into mbed OS, including implementation of thread safety support. 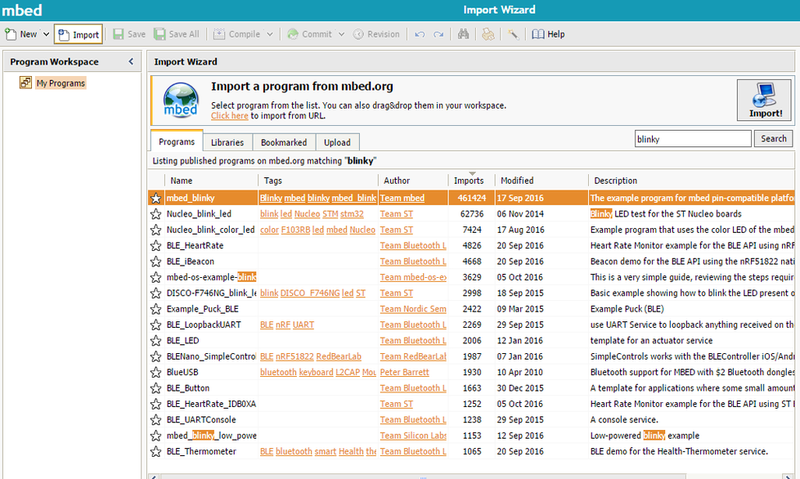 mbed Online Compiler is a compiler for mbed-OS. 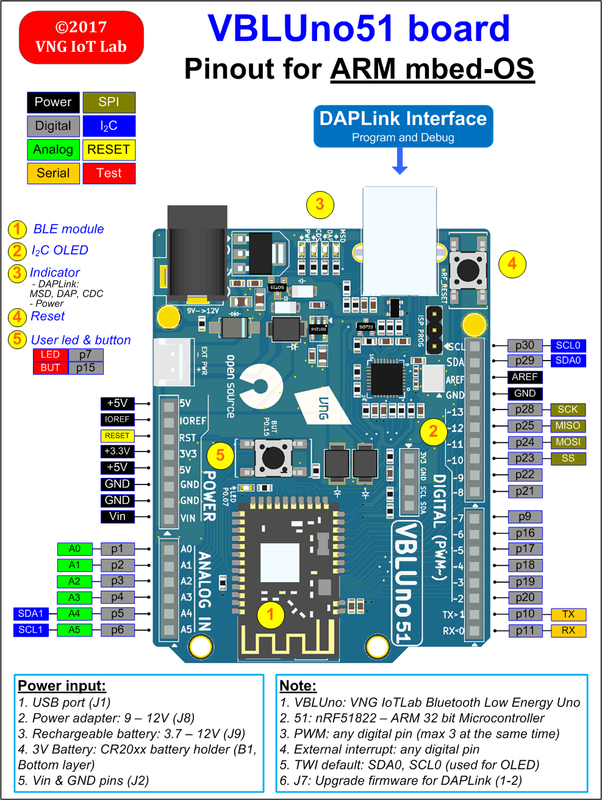 It works online, you need only a computer with internet connection, you can write code and compile easily for the VBLUno51 board. 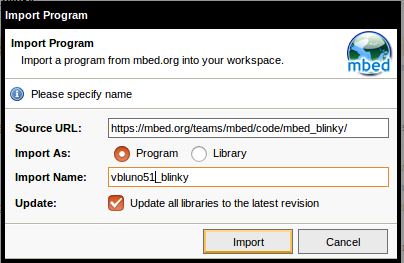 The following sections presents the steps to using mbed Online Compiler. Access to [https://developer.mbed.org] (https://developer.mbed.org), register an account for developers with mbed OS. It is completely free so you can confidently register. 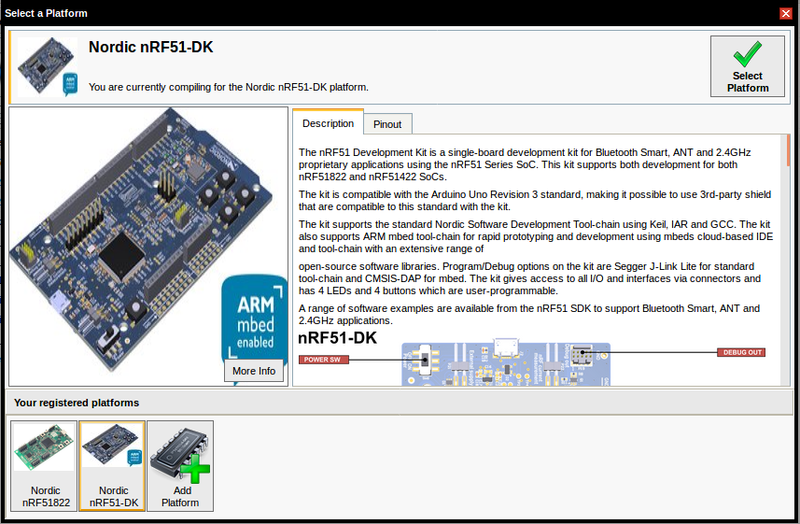 You select Nordic NRF51-DK board. This board has configuration quite similar to the VBLUno51 board. Click on Compiler button to return to the compiler, the right-hand corner of the browser will display the Nordic NRF51-DK board. 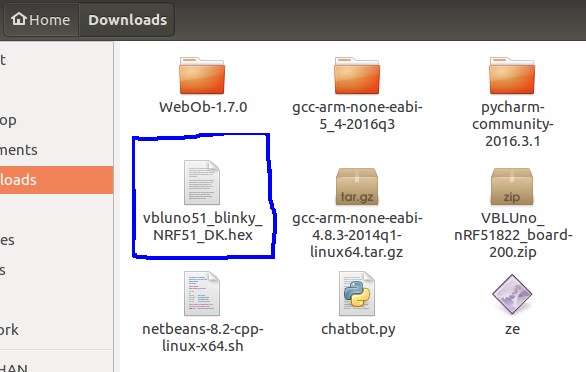 In this step, we are going to make a simple example, with name "vbluno51_blinky”. You can edit the project name follow below picture. 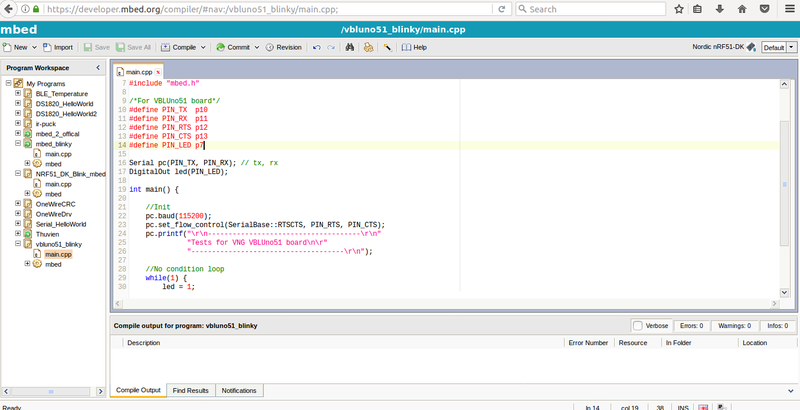 Copy the following source code to main.cpp file. 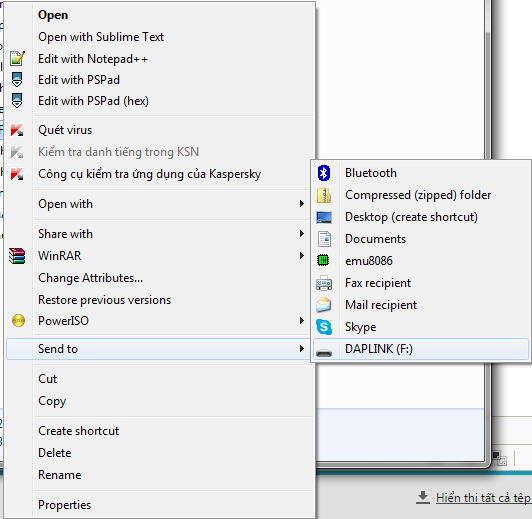 "Tests for VNG VBLUno51 board\n\r"
After the VBLUno51 board is connected to computer via USB cable, a partition which has name is DAPLINK will be added to your computer. For downloading executable file into VBLUno51 board, you only need to copy this file into the above partition and wait for this progress is done. After loading executable file into VBLUno51 board is done, the application will be run automatically. If every thing is success, you will see LED on the VBLUno51 board is lights on and off at 2 second intervals. Using a terminal software such as Hercules or PuTTY to connect to the VBLUno51 board at 115200 baud speed, you will see results as the below image.